Margy’s Hut under the snow, back. If you remember your first view of Margy’s Hut as a great relief to your sore and tired hiking muscles and oxygen-deprived brain, consider the relief you would feel in the dead of winter. Hiking up to Margy’s on skis adds weight far beyond the load you might have carried on a warm summer day. In addition to a rain jacket are heavy gloves or mittens, a thick stocking cap, down parka, snow pants, boots, goggles, face protection, ski poles, avalanche shovel, probe pole and a search beacon. Then there is the added weight of skis and climbing skins, long underwear, extra socks – and the list goes on. Margy’s Hut under the snow, front. Oh, and don’t forget food, sleeping bag, and the usual necessities like water, lunch, snacks, etc. In winter, there is no shuttle to the hut, so everything goes on your back. The effort is fresh in my mind because I skied to Margy’s Hut the first weekend in February with my son, Tait, and the slog was longer than I had remembered. We went up the winter route of Johnson Creek, which is shorter and more direct than the summer route up Woody and Spruce Creeks that we follow with our summer trips. Johnson Creek takes off the main road beyond the Woody Creek trailhead and switchbacks up steep hairpin zig-zags. The day Tait and I went up was one of the first sunny days in weeks, so it felt good to strip down to bare skin and sweat out those steep grades in the heat of a warming sun. The climb took about four hours, and by the time we reached the clearing where Margy’s stands the sun was low and the temps were plummeting. Pushing our skis along a well-beaten track through the final stands of spruce and fir, there was Margy’s, all but buried in snow up to the tops of the windows. We skied from level snow right onto the deck, the stairs completely buried. 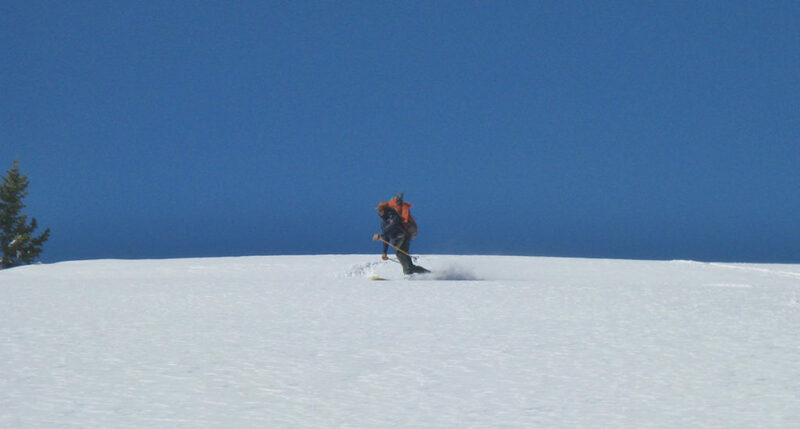 Tait ascending an unnamed pass with the peaks of the Elk Range behind. I got a fire going in the kitchen cook stove to take off the chill that had settled on the old log cabin, and soon the crackling of dry wood produced a whiff of pine and a radiating heat that felt good to back up against. Hot water on the range was poured into mugs for steaming gulps of hot chocolate while, beyond the front windows, the sun set on the Williams Range with a subtle orange hue. 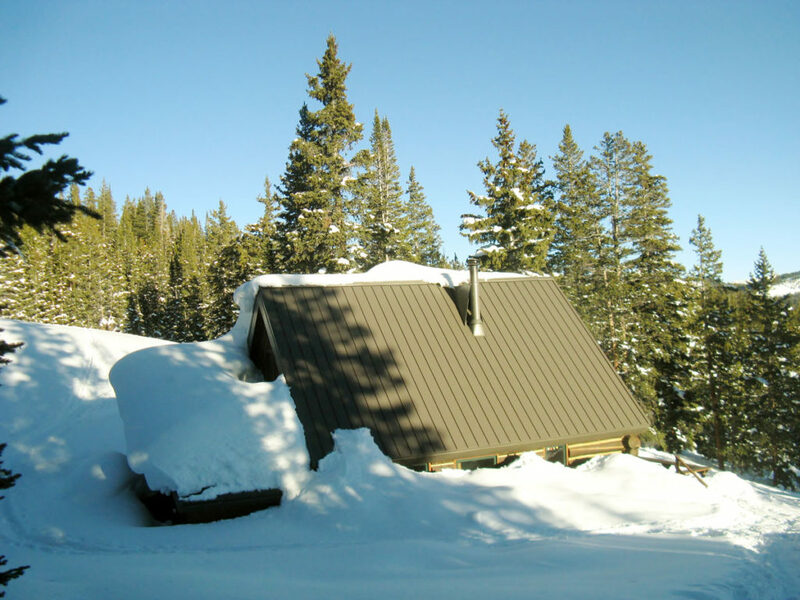 Tait and I shared the hut that night with three young skiers from Steamboat Springs – two beautiful sisters and a boyfriend – who returned at dusk for a ski tour to the top of Mt. Yeckel. 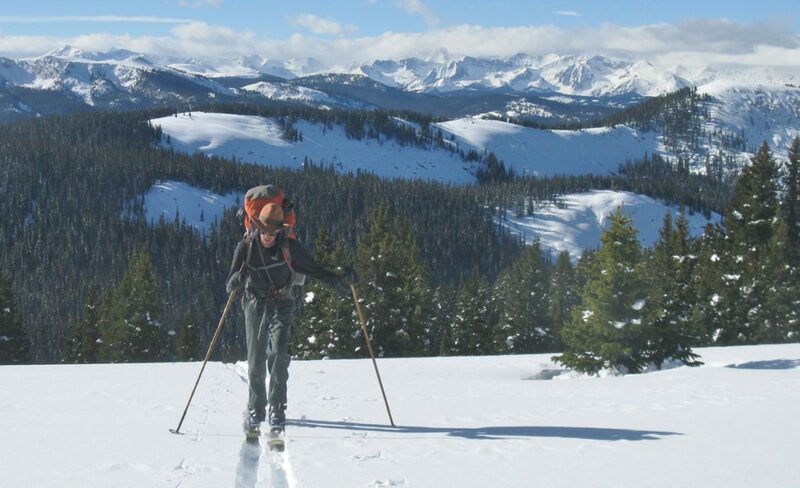 While they spent the evening rolling dice on the Monopoly board, Tait and I were early to bed in preparation for a long ski tour the next day into the headwaters of the Hunter Creek drainage. In the quiet of the morning, Tait and I enjoyed a 4-egg omelet with grated cheese, grilled fruit bread, crispy turkey bacon and strong, black coffee. We packed our gear and were off as the sun slanted across the valley and glanced off the windows of the hut. The sky was deep blue and clear. The temperature was 10 degrees. The ski down to Sawmill Park was like a luge run through the thick timber, requiring a series of quick telemark turns to avoid kissing the rough bark of a spruce tree. The trail sign at Sawmill Park was buried almost to the top. 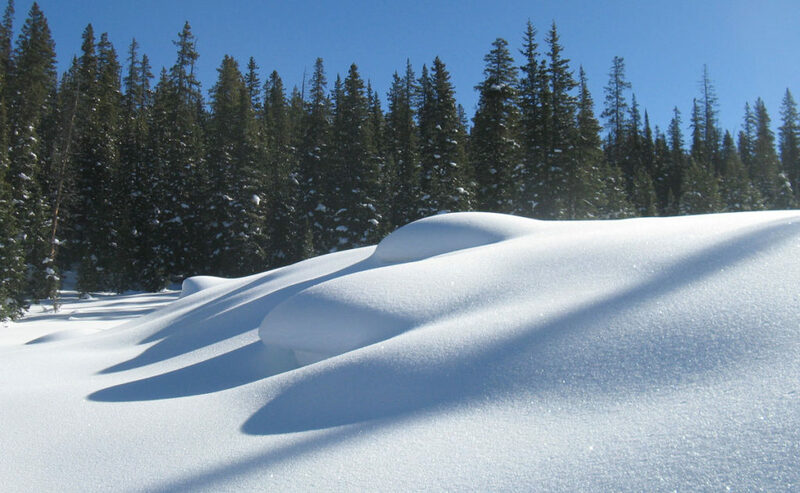 A quick probe of the snowpack showed five feet of snow on level ground. We felt like we were levitating over the ground as we skied another mile down the Spruce Creek trail. Tait making telemark turns in “hippie pow” on the gentle slopes high at the headwaters of Hunter Creek. Tait had a route mapped out in his head that we followed across the creek and up a series of small, connecting meadows. The sun glinted like a million diamond chips in the bright sun, and the depth of the blue sky formed a stark contrast to the blinding white of the snow. Skinning up a sunny meadow above Spruce Creek. Up and up we went, Tait breaking trail for his grateful father. The snowpack had a solid base that made trail breaking reasonable through six inches of eiderdown. We eventually summited the 12,200-foot ridge that can be seen from the deck of Margy’s across the deep valley from which we had climbed. We stripped off our climbing skins at the top of the ridge on this calm and beautiful day, and we swooped down with gentle turns on a gentle slope over perfect snow to find a makeshift winter camp to be dug in the deep snow at 11,600 feet. We would spend the night six feet under in a snow cave dug with our avalanche shovels. Admittedly, the 10-hour night in our snowy berth was long, but we were snug in our down sleeping bags like a pair of hibernating bears. And in the dark of night, when the hot tea we drank before bed made the urge to climb out undeniable, we were greeting by a night sky smeared with glistening stars and planets that seemed to mirror the glittering snow crystals of the day before. 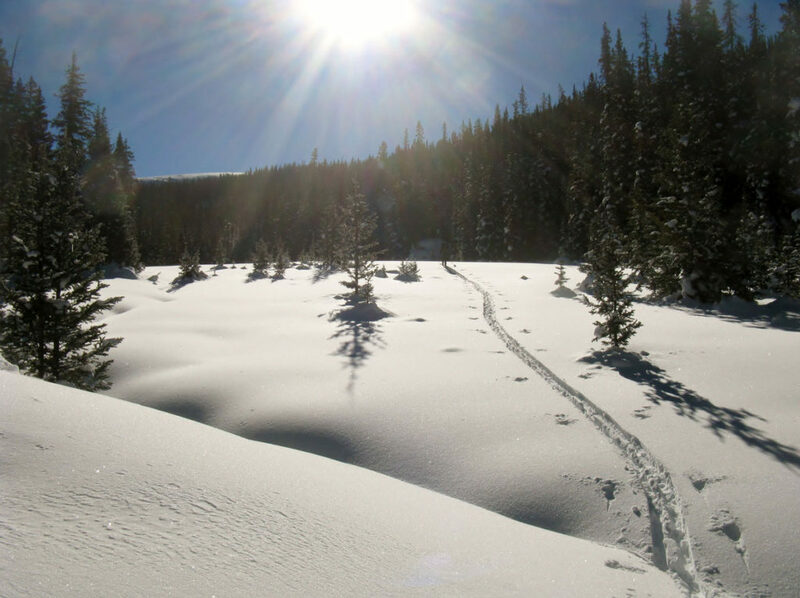 With a warm breakfast of instant oatmeal and coffee in our stomachs, we packed up and skied a beautiful, undulating, low-angle slope down to the valley floor, then tracked through woods, across meadows and over boulderfields – all covered deep in snow. Sometimes we skied right down the creek bed over great hummocks of snow and the creek murmuring faintly below. Deep snow and soft textures. 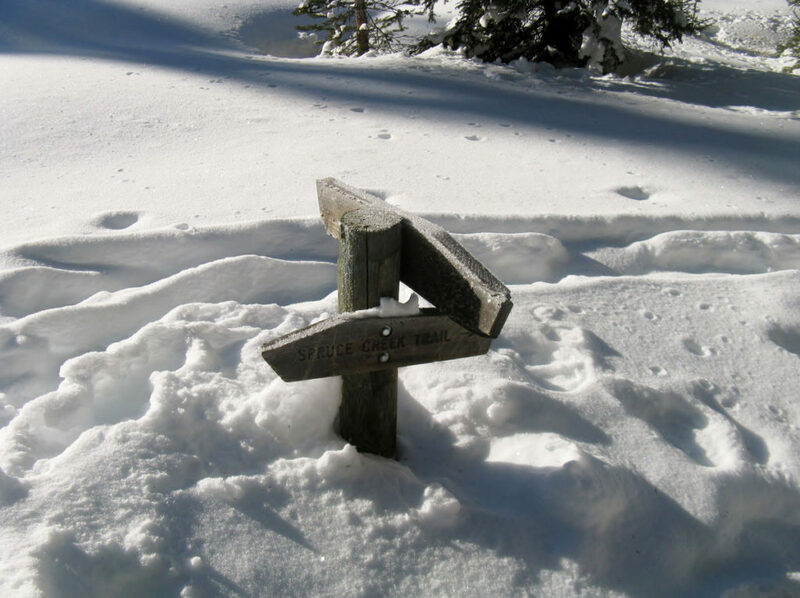 When we finally reached the familiar junction of Woody and Spruce Creeks, the trail sign was barely visible. 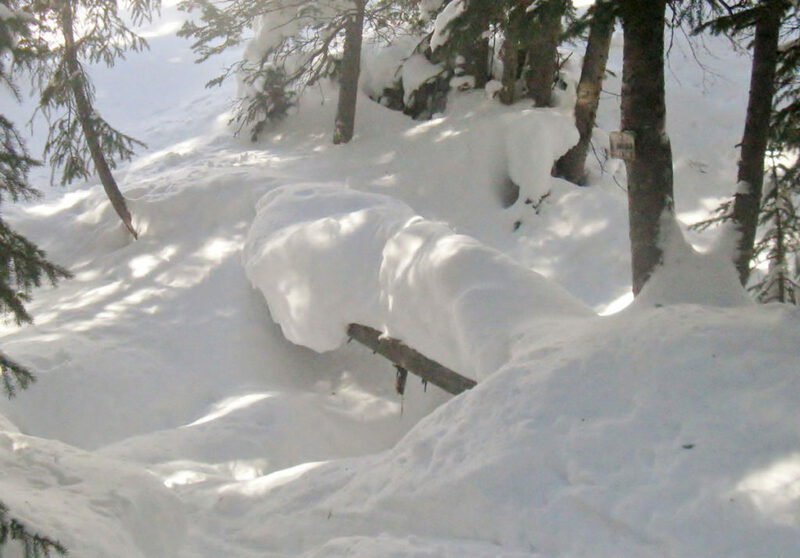 We skied across a snow bridge instead of crossing on the usual log upon which stood three feet of snow. The lower trail to Lenado was narrow and fast and required quick moves to flash through tunnels of overhanging brush roofed over with snow. The log bridge crossing Spruce Creek was piled high with snow, so we crossed on a snow bridge. Back at the car, the promise of cold beer was thwarted with frozen cans that spewed beer slush that still went down thirsty throats with relish. A more substantial repast was enjoyed at the Woody Creek Tavern, with a toast to Margy’s Hut and to the beauty of deep winter in the Hunter-Frying Pan Wilderness of our beloved Elk Range. Have a written piece you would like featured on our blog? 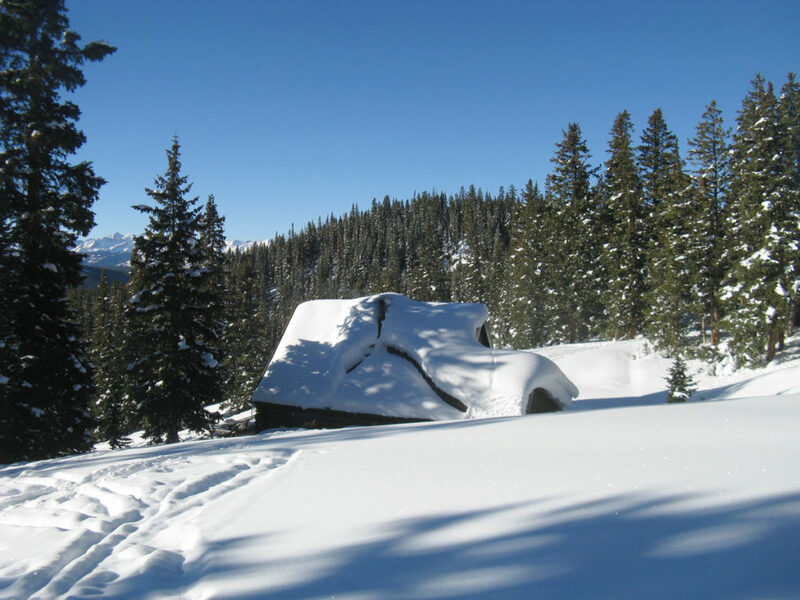 Huts for Vets was founded in Aspen, Colorado in January 2013 to provide, at no cost to participants, wilderness and communal experiences as therapeutic healing for U.S. veterans and active-duty service members.